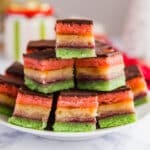 Whether you call these authentic Italian cookies Neapolitan Cookies, Tricolor Cookies or Rainbow Cookies, they are so delicious and are a gorgeous addition to any cookie platter! Preheat oven to 350 degrees. Grease 15.5" x 10.5" pans and line them with wax or parchment paper. Grease the top of the wax paper as well and set aside. Mix the butter and sugar until well combined and fluffy. Add egg yolks and mix well to fully incorporate. Add almond paste and flour and mix until just combined. In a separate bowl with separate whisk attachments, whip egg whites until they've doubled in size and are fluffy. Gently fold egg whites into the almond paste mixture until combined. Split the mixture into three separate bowls and add red food coloring to one bowl and green food coloring to another bowl leaving the last one plain. Use your judgement on drops, but I used around 10 drops each. Spread the batter evenly into the pans (be aware it will be quite thin) and bake for 10-12 minutes- keep an eye on them, they may need to go a bit longer if you put them in together. Once they've cooled, line a large pan with wax or parchment paper. Flip the green cake onto the pan first and evenly spread the raspberry jam on top. Next flip the yellow cake on top of this. Spread apricot jam evenly over the top of the yellow layer. Finally top it with the pink layer. Place some wax or parchment paper on top of the cakes followed by another pan. Weigh the cake down with a phone book (or a pile of books, which is what I had on hand) and chill overnight. The next day, uncover the cake. Melt the chocolate chips. You can do this in a double boiler over low heat stirring often or in the microwave in 30 second increments stirring between. When the chocolate is mostly melted add the coconut oil (or butter or vegetable oil if you're using that) and finish meting. Stir to combine. Chill this until the chocolate has hardened. Cut where they are scored and refrigerate until serving.